Protesters demand the annulment of agreements signed by Croatia and the Catholic Church. Secular campaigners plan rally demanding end to deals with Vatican which they say are too expensive and undermine secular values. Secular campaigners are organising a protest in Zagreb on Saturday, demanding abolition of Croatia’s concordats with the Holy See, claiming they incur massive financial obligations and breach secular principles. 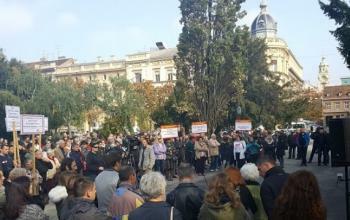 The Movement for Secular Croatia – an informal network of atheist, agnostic and secular NGOs and individuals, have called the protest ‘Termination 4”. Croatia and the Holy See have signed four concordats regulating all the obligations of the state towards the Catholic Church. The key concordats regulate how much money Church gets from the state budget and the role of the Church in education and culture – which envisages religious education classes in state kindergartens and primary and high schools. Although Croatia is predominantly Catholic – over 86 per cent of the population in the 2011 census declared themselves Catholic, and although the Church has a considerable place in Croat national history and identity, not everyone approves of the significant concessions given to the Church. Alan Soric, a legal expert from the secularist NGO Protagora – part of the movement organising the protest – told BIRN the protest is being held because of “daily breaches of the secularity of the Croatian constitution” in implementing the concordats. “In general, in the concordats, Croatia has only obligations, while the Church has rights,” he said, pointing to Church’s influence on education. “Specifically, this especially concerns state schools, where Catholic religious education is held and pupils go to Catholic services,” he said, mentioning also the controversy over the proposed merger of the Faculty of Humanities and Social Studies and the Catholic Theology Faculty in Zagreb. Soric says the situation will not improve until the concordats are scrapped, since they prescribe the teaching of religious education in school inside regular schedule, although not all pupils attending the classes are Catholic. An additional hot issue are “the massive financial obligations Croatia has towards the Catholic Church”, he says. The money given to the Church annually ranges between 33 and 80 million euros, depending on what is included in the sum, he noted. He notes that besides paying two average Croatian gross monthly salaries – 1,070 euros in 2015 – to each of the 1,600 Catholic parishes, the state pays for religious education teachers and for the printing of textbooks – both chosen and approved by the Church without requiring the consent of the state. The state also covers the cost of renovation Church property and of chaplains in the military and hospitals. The Church is also exempt from payment of taxes for its donations – unlike all other humanitarian organisations. “This doesn’t count the money given by local authorities, which are not recorded in any way,” he explained. “There are over 2,000 NGOs which were directly created by the Church or closely affiliated, and which are in part financed by the state,” Soric concluded. An analysis of the money given to the Church by the state done by an independent media outlet, Lupiga.com, in 2014, came to the figure of over 1.1 billion euros paid to the Church between 1996 and 2013. Catholic theologian Drago Pilsel told BIRN that although he “doesn’t share the views of some somewhat radical groups and individuals in the Movement for Secular Croatia”, he agrees that the Church “maybe receives too much money from the state, having in mind the state of public finances”. “It’s not fair to take someone’s money to finance the Church without his consent. I advocate the German model, under which each individual decides … which religious community or NGO, according to their personal beliefs, they pay a part of their taxes to,” he said. Nevertheless, Pilsel said he doubted radical atheists and secularists would “have any effect on the general population”.